Understanding the science of sailfish migration, reproduction and feeding behavior and why multiple hook-ups are so common. By April Huffman Msc. This is the time of year when most captains, mates and owners in South Florida start thinking about the winter sailfish season. 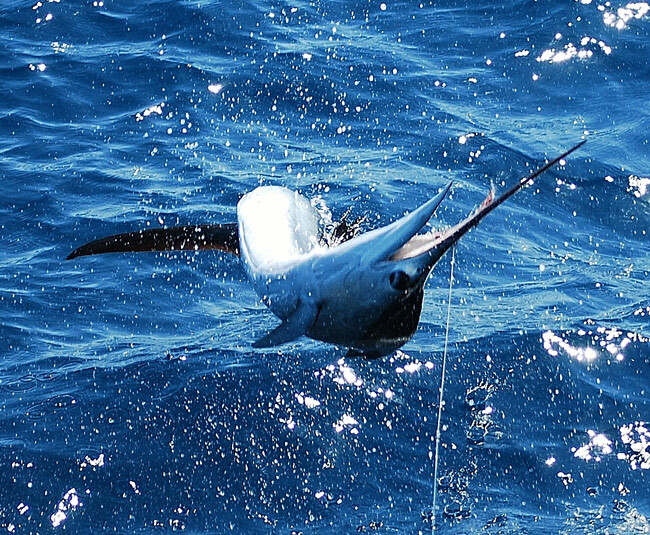 With many sailfish tournaments around the corner, it’s time to put away the heavy marlin tackle from the summer months in the Islands and plan your strategy. One of the most exciting things about sailfishing is that it is common to get hooked up on multiple fish. 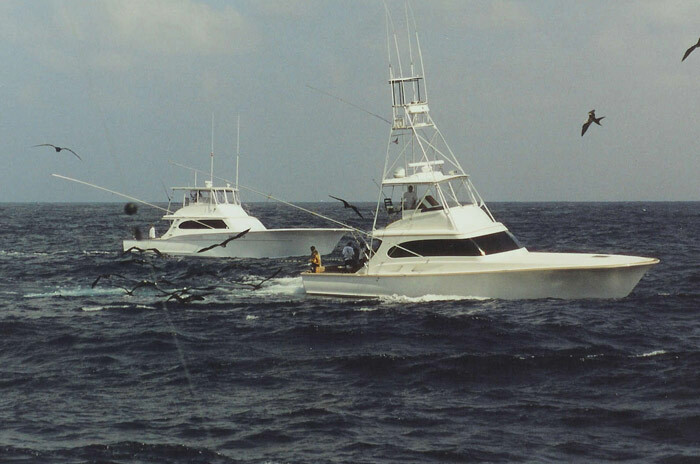 Few thrills in sportfishing can match all the rods bending at once with anglers and mates stumbling over each other trying to clear the spread. Atlantic sailfish are found throughout the tropical and temperate waters of the western Atlantic from the Gulf of Maine south to Brazil, including the Caribbean and the Gulf of Mexico. They migrate throughout this range. Compared with marlin and swordfish, sailfish are a near-shore species. Sailfish are believed to live up to 10 years and reach average weights of 110 pounds in the pacific and 55 pounds in the Atlantic. 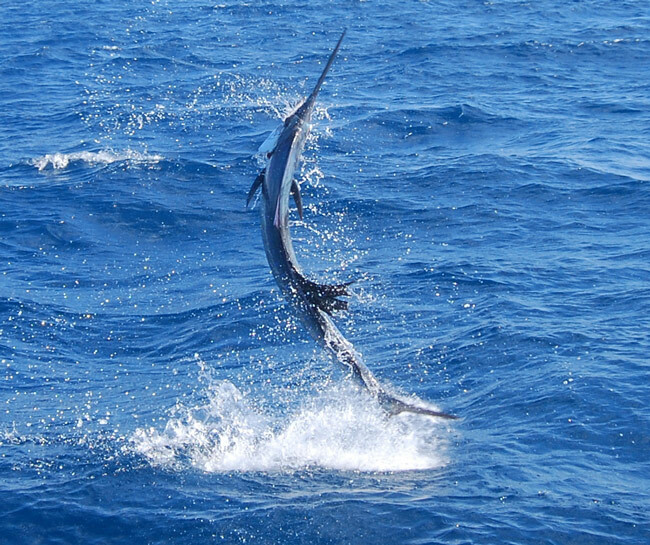 Atlantic sailfish spawn throughout the year in the open tropical and sub-tropical waters of oceans and seas. The majority of spawning occurs during the summer in the area in which they are located. During spawning, males and females pair off, though sometimes several males will engage a single female. Females release as many as 5 million eggs, which are fertilized in open water by the male. Each clear egg is a single droplet of oil surrounded by a pale yellow membrane. The tiny eggs then float until hatching about 36 hours later, at which time the young begin to grow rapidly. While all related billfish have a high dorsal fin as juveniles, only sailfish retain the high fin throughout life. Both Atlantic and Pacific sailfish feed primarily on small, schooling fish. 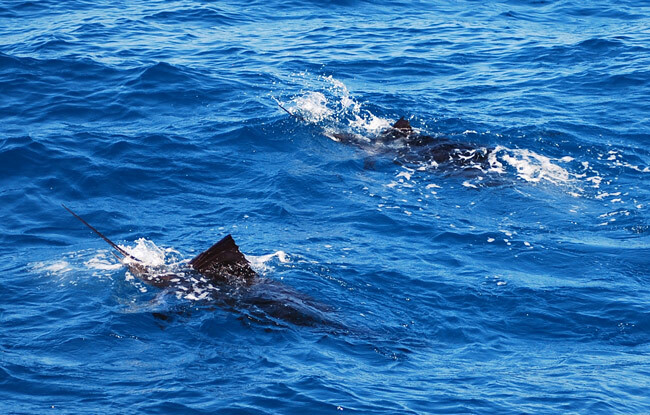 They stay at depths above the thermocline, in waters with temperatures between 70 and 85 F. Compared to the Pacific sailfish, they usually stay in deeper water year round, going to depths as great as 600 feet. 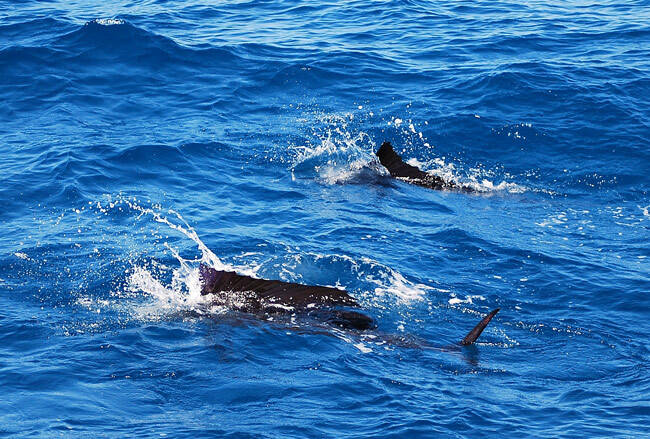 Many fishermen have observed groups of feeding sailfish schooling baitfish. Sailfish will work together in hunting groups to facilitate capturing prey. 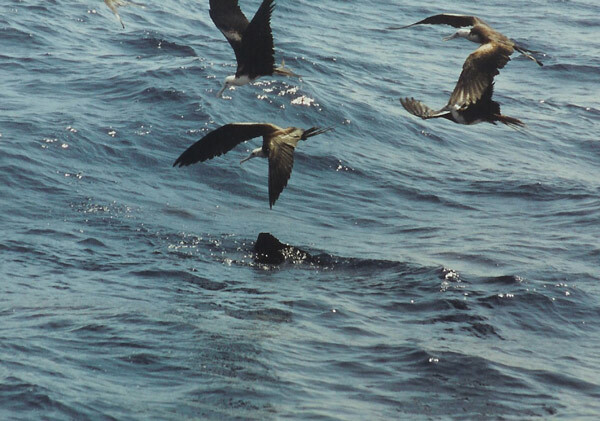 In a group, they are more capable of rounding up a school of prey into a “bait ball” by using their fins to form a wall to keep the prey confined while driving it to the water surface where there is little chance of escape. One by one, the sailfish dart in to feed, and return to the outer circle, awaiting their next opportunity. While baitfish often exhibit group behaviors that benefit the school, this type of cooperative behavior is not often found in oceanic predators. The very intelligent Orcas (or killer whale) are another well known predator that works in coordinated packs. This group hunting behavior is also a reason for so many multiple hook-ups when fishing for this species. Have you ever wondered why there seems to be an abundance of sailfish in the winter season? Is it that they, like many Americans, prefer the comparatively mild Florida winter? This is closer to the truth than you may think. Although they can be found in a huge area of the ocean, Atlantic sailfish definitely favor areas near the Gulf Stream, congregating in the warm waters just offshore from the continent, out to the continental shelf and over seamounts. Their migrations are directly linked to changes in water temperature. On the Atlantic coast of the United States, they will migrate north in April and May and begin returning to southern waters in September and October. These migrations are so closely associated with temperature that arrival of Atlantic sailfish in a particular location can be anticipated with a high degree of accuracy. So sharpen your hooks and rig your ballyhoo, the sails come marching in!